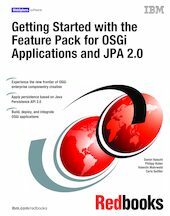 This IBM® Redbooks® publication introduces OSGi applications and Java™ Persistence API (JPA) 2.0 technology and describes their implementation in the Feature Pack for OSGi Applications and JPA 2.0 for WebSphere Application Server 7.0. The book will help you understand the position of these new technologies as well as how to use them for Java enterprise development in a WebSphere Application Server environment. Though synergetic, both technologies can be used in isolation. This publication is structured to appeal to administrators, application developers, and all those individuals using the technologies together or independently. The book is split into two parts. Part 1, "Architecture and overview" on page 1 introduces OSGi applications and JPA 2.0 and describes how to set up a development and test environment. Part 2, "Examples" on page 55 uses examples to illustrate how to exploit the features of OSGi applications and JPA 2.0.